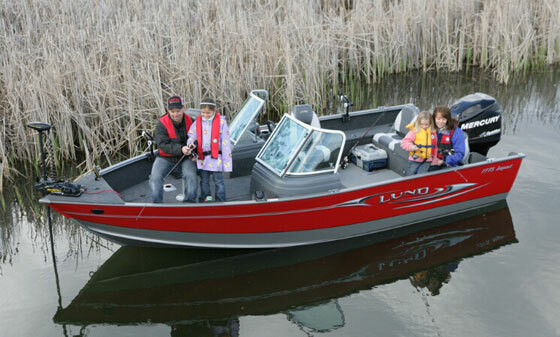 When the entire family wants to go fishing - or not - a Lund 1875 Crossover matched with a Mercury 150 Fourstroke gets the job done. Promoting family boating bliss is the mission of the Lund 1875 Crossover XS, which is a notable departure from recent model intros like the Lund Impact Sport 1775 and the Lund 1600 Fury. 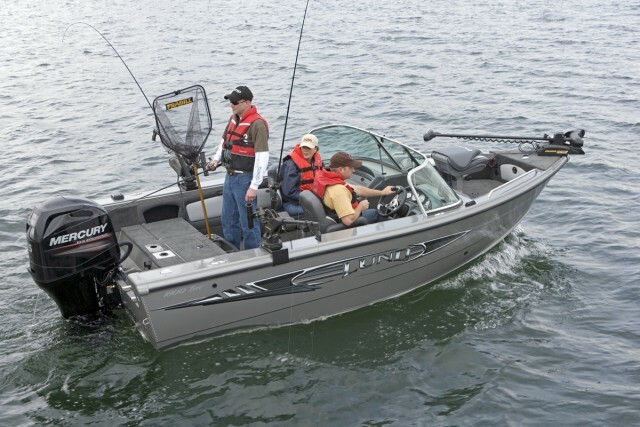 The Crossover is not some all-things-to-all-people triumph; rather it’s a way for anglers to get in a Lund aluminum fishing boat—still the Cadillac of the North Woods—without being totally selfish and alienating those members of the clan who could care less about the bite. The Crossover name is borrowed from the auto industry, where it’s become a catch-all description for cars that offer some pretense of SUV ruggedness while retaining a good bit of comfort and economy. 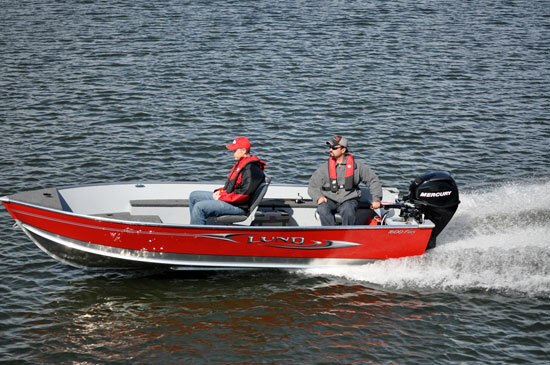 The Lund Crossover swings the other direction, in that it’s a fishing boat with some accommodations to other on-water activities, such as an available ski-tow pylon, bow cushions, comfortable seats, and a decent audio system. 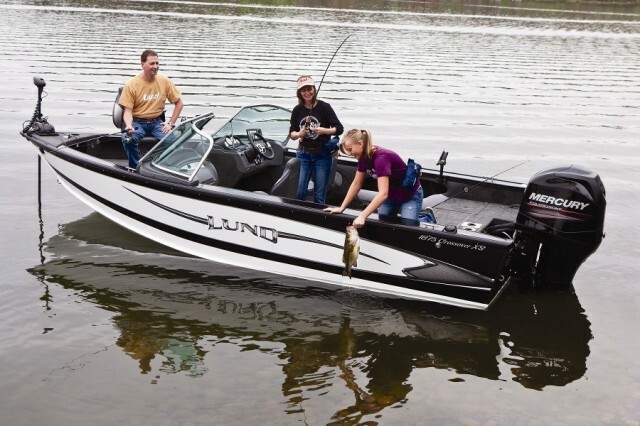 Lund also gives the 1875 Crossover XS a family-friendly price, at least for the premium end of the aluminum boat market, with a base MSRP of $32,284 with a Mercury 115 FourStroke outboard (trailer not included). 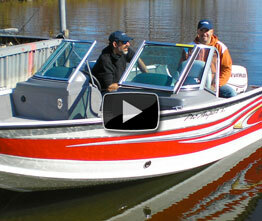 The price jumps to $35,155 with Mercury 150 FourStroke on the transom, a more satisfying package and also our test power. Compare that to the Lund Tyee 1900, which is a few inches longer and wider but has a similar lay-out, at $41,400 with the Merc 150. Compare the Crossover and Tyee side-by-side and note that the Tyee has a fancier dash, covered inwale stowage compartments, a livewell in the bow, extruded aluminum gunwale caps that add two inches of freeboard, and the Lund IPS2 hull, which features spray rails. The Crossover may be missing these mostly fishy details, but that does not detract from its multi-purpose utility. Its foundation is a double-riveted aluminum hull that’s double-thickness from amidships forward, supported by I-beam stringers. Deadrise on the Crossover is 16 degrees at the transom. Its IPS running surface features a pad at the transom to funnel solid water to the prop; hard reverse chines benefit handling and stability. Cockpit features start aft, with a pair of three-way jump seats that flank the fishing platform. Fold them down and they become part of the carpet-covered platform. Flip the backs up and you’ve got two seats. Flip the bottoms up to reach handy stowage below. Between the seats is a curved kick-out that incorporates drink holders and “trinket trays” with slots for fishing tools. 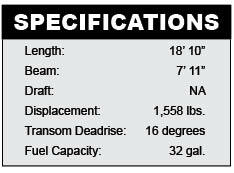 The optional ski pylon ($473) fits dead-center on the aft platform, just behind an 18-gallon lighted live well. A reboarding ladder is standard and hides below a panel to starboard of the motorwell. Jump seats fold down to create fishing deck, and also cover stowage. Note that sun top stows below the seat base. A fishing seat base is offset from the outboard. A ski pylon is an option. The Crossover comes with three pedestal seats, including a driver’s seat with fore/aft slider. Inwales are nicely finished in multi-color vinyl even if the stowage compartments are uncovered. The consoles are a new shape, and to port there’s a large locking glovebox. A Clarion audio control mounts on the dash, and there’s a separate MP3 input with a handy little cubby to hold a phone or music player. A large flat on the right side will hold your fishing electronics. The tall glass windshield curves stylishly around the consoles and does a great job knocking down the breeze in much of the cockpit. 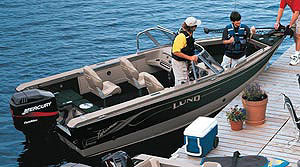 Lund offers all manner of canvas options for this boat. The main in-deck stowage compartment does not have rod tubes, which can be added as an option, to keep it open for ski or wakeboard stowage. 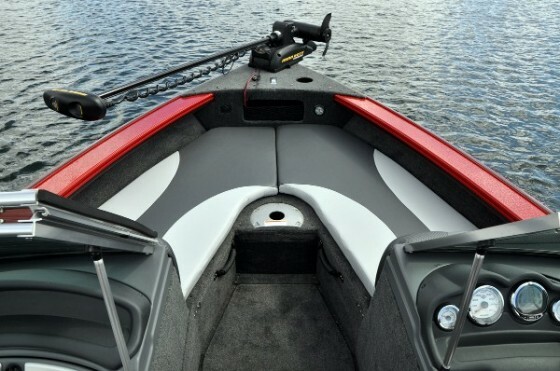 A dedicated rod locker is located below the bow and accessible through a hatch in the walk-through. It has five tubes for seven-foot rods. Rods up to eight fee long can be stowed in the port inwale compartment. The bow platform is raised about 11 inches above the main deck. There’s no livewell in the bow, but two large stowage compartments are handy and can be rigged for trolling motor batteries. There’s a spot for a charger below the center rod stowage. Padded backrests are placed on the front side of each console, but the pads required to turn the bow into a sun lounge are a $697 option. A deck insert and additional pad are also available to expand the area. The depth forward is minimal – I would not let passengers ride in the bow while underway – but with the boat at anchor or nosed into the beach the pads will be just the ticket. The optional bow cushions seem pricey but will be a big selling point to some family members. LED courtesy lights like the one in the bow peak are helpful when fishing or cruising after dark. The four-cylinder Mercury 150 FourStroke is a great match for this boat, combining adequate power with exceptional fuel economy. We saw a top speed of about 49 mph with a light load and a 14 x 19 Mercury Enertia stainless-steel prop on the motor. Note that a stainless steel prop is an upgrade over the standard aluminum Black Max wheel. 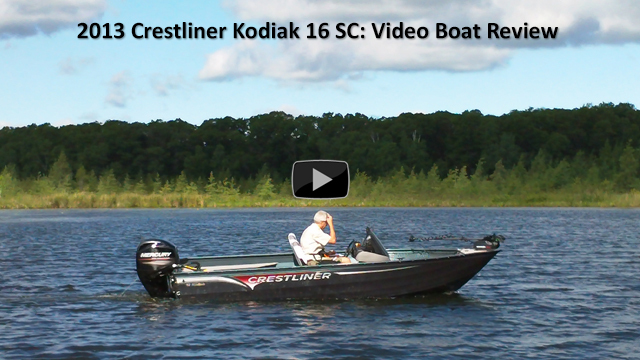 It was a choppy day on Lake Detroit in Minnesota when I ran the Crossover, and I was impressed with the way the Lund IPS hull tracked in a cross-wind and delivered a smooth, dry ride. Move up to a Tyee model and you get the IPS2 hull, which adds a spray rail, but I did not notice the Crossover ran wet at all when I tested it. 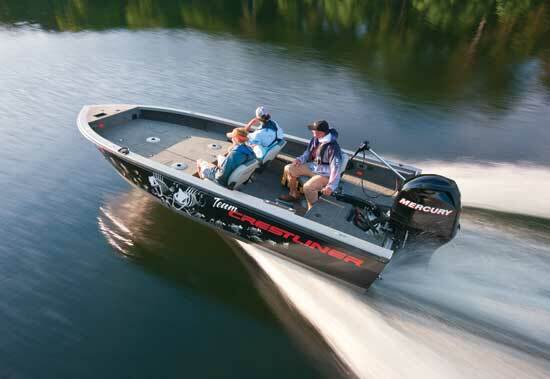 There are all kinds of options for a buyer considering one boat that can serve double-duty as a fishing and family craft. 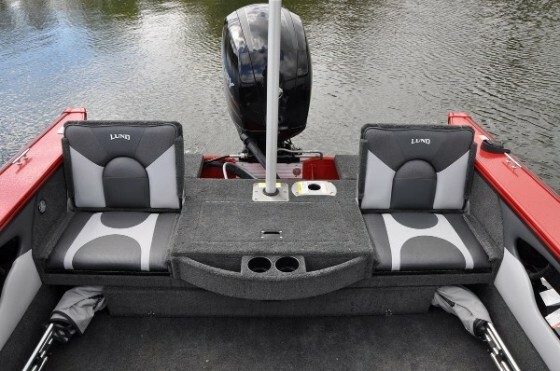 No doubt the Lund Crossover swings the compromise pendulum way over to the fish side; if you are at all serious about fishing, you’ll be much happier with the Crossover than with some “fish and ski” fiberglass bowrider conversion. Another big consideration should be resale value. When it’s time to move on, the Crossover will be desirable precisely because it’s pretty fishy - and because it’s from a brand associated with quality. Other Choices: Crestliner’s 1850 Super Hawk also has a fishy-family mix, tilting a bit more towards the family side of things. The same is true of Starcraft’s Starfish 176, though this boat’s a hair smaller. For more information, visit Lund. 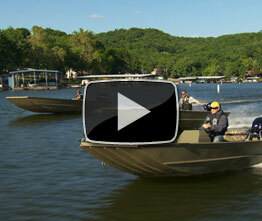 Test conditions – Sunny and 70 degrees, lake chop, 20 mph wind.